Training can be one of those tricky things to stay on top of individually and as a practice. More so these days with the ever increasing list of training requirements. Some training is just a one-off; other training needs to be repeated yearly or every three years. 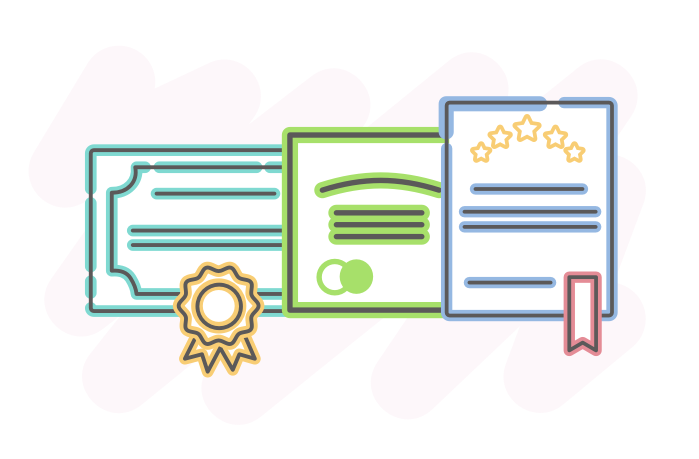 On top of that keeping track of all the certificates to use as evidence can be a real pain. 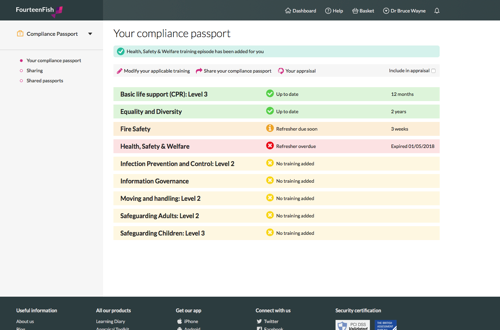 We thought it would be great if we could create a simple online tool to help with this - we call it the Compliance Passport and you may have already seen it on your Dashboard. This is a free feature that anyone can use to keep track of their training throughout the year. 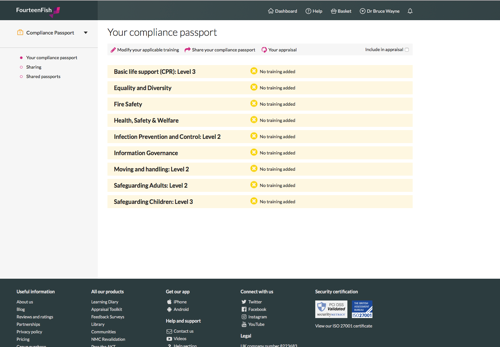 When you click on the Compliance Passport for the first time you will see a list of training that you can select from. You will see we have selected a few for you that we think are relevant to the profession you are marked as you can deselect any that don't apply to you and select any that do by clicking on them. 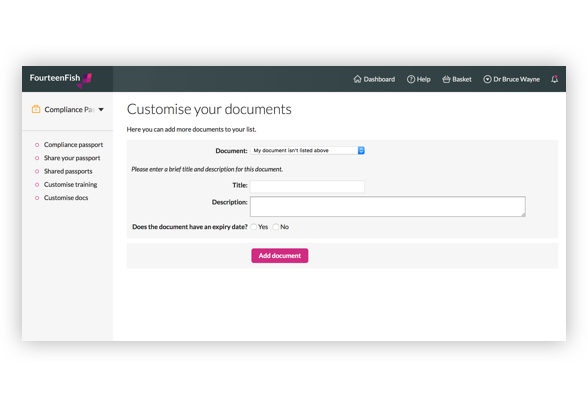 You can then save your selection by pressing the pink button at the bottom. If you are unsure of what training you need to do please contact your CCG. You will then see a list of all the training you need to complete in yellow. You can click on each item to edit them. You can add the date you completed the training at the bottom and you can attach the evidence file, usually a certificate. You will also see some helpful additional information about the training, for example how often you need to complete that particular training. 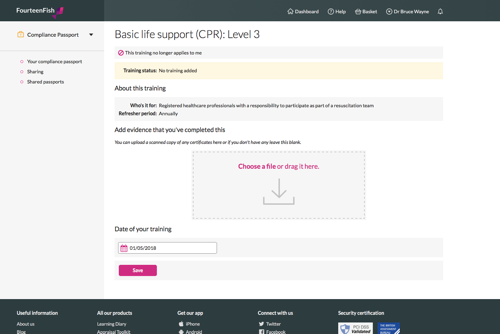 Once you click save you will see the training item changes colour and a time period will be displayed on the right indicating how long until you need to renew your training. If any of your training is due (or overdue) you will see them displayed in red and you will also be sent an email to remind you that you have training to complete. You have the flexibility to update your training at any time, for example updating existing training or adding new items. 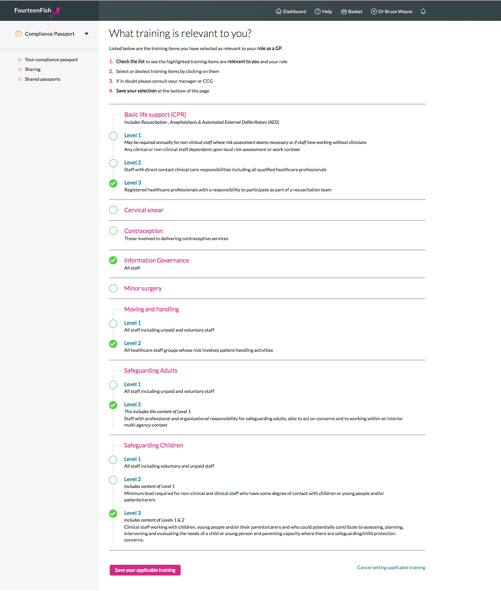 If you use our Appraisal Toolkit you can also tick the box in the right-hand corner 'Include in appraisal', and your training will be visible to your appraiser in your appraisal summary. Share your Compliance Passport with others. 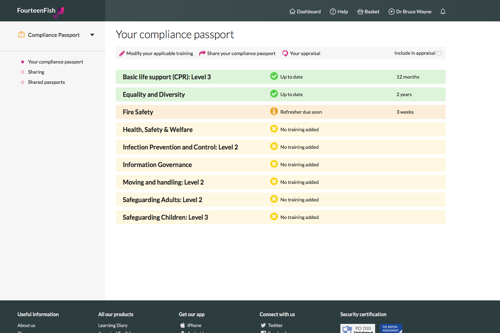 The best feature is the option to share your Compliance Passport with a colleague (or two, or three... you get the idea). So, for example, a Locum GP could share their Compliance Passport with a Practice Manager to provide the evidence needed when working for a practice. 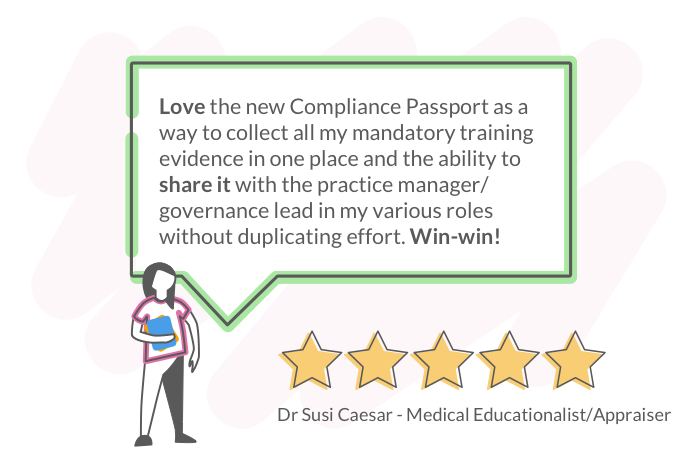 Or a few GP Partners could share their Compliance Passports with their Practice Manager so that the PM can see if everyone is up to date with all their training and schedule training if needed. So there you have it! Another helpful tool from the Fish Team. We hope you like it and find it useful, we have already had some lovely feedback from users and we look forward to hearing more. Leave your feedback on our reviews page and if you have any questions about this or anything else please contact support@fourteenfish.com at any time, we are always happy to help! 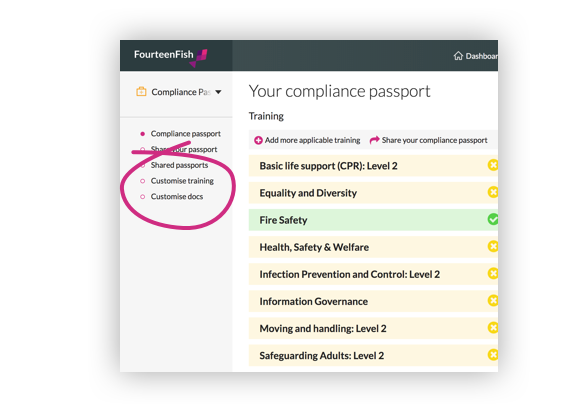 Our developers here at Fish HQ have been working hard to add new useful features to the Compliance Passport to make it even more helpful! 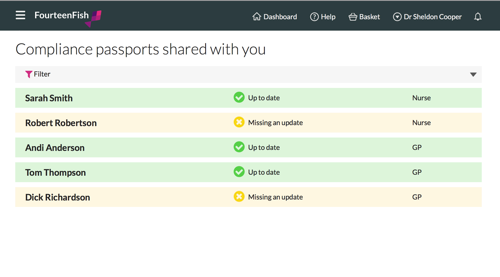 You can now add other important documents to your passport so you only need to look in one place for everything. For example, your driver's license, references, insurance documents and anything you want to keep in one place. 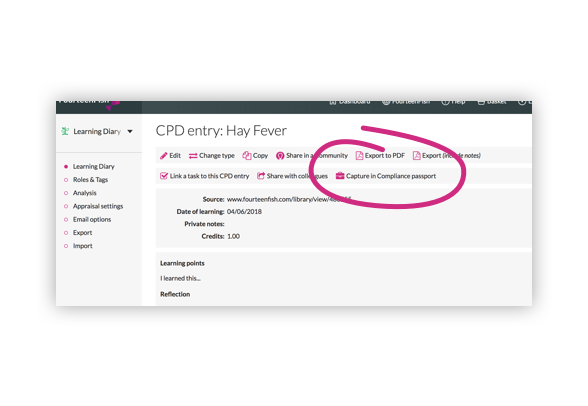 If you have completed some bespoke training you can now add it to your list by clicking on the 'Customise training' option in the toolbar. This allows you to add training not already on the list. For example specialist counseling training, ear surgery, etc. 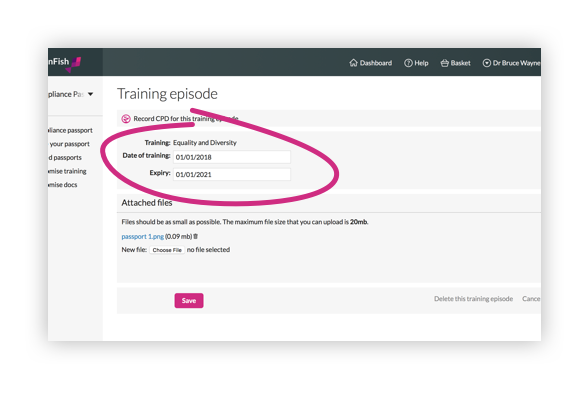 Sometimes timescales for training can defer area to area so we have enabled users of the Passport to edit there dates to fit the timescale expected in their area. This may also help people who have had or are planning career breaks. 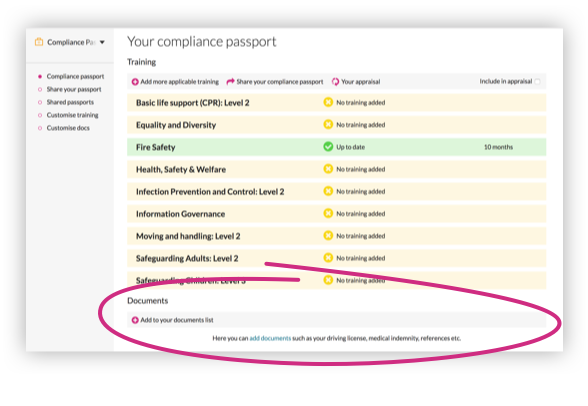 Possibly the best update is that you now have the ability to add training straight into you Learning Diary with a click of a button and learning entries into you Compliance Passport. We hope you find these updates useful!